Hi, my name is Mark Scholes. I am highly trained in the management of adolescent athletes, with a particular focus on the treatment of hip and groin pain. As an APA Sports Physiotherapist, treating sporting injuries is a strong passion of mine and outside of Complete Sports Care, I worked as the Dandenong Stingrays Football Club physiotherapist from 2008-2017. This interest in athletic hip and groin injuries is driving my current PhD candidature which is investigating lower limb biomechanics in athletic patients with hip pain. Treating plenty of younger athletes has led me to have a particular interest in the management of lower limb injuries, including tendinopathies, and this allows me to successfully apply these same treatment principles to athletes of any age. My work has exposed me to thousands of junior and adolescent sporting injuries, helping me to develop exceptional knowledge in age-related musculoskeletal changes and management of adolescent sports injuries. 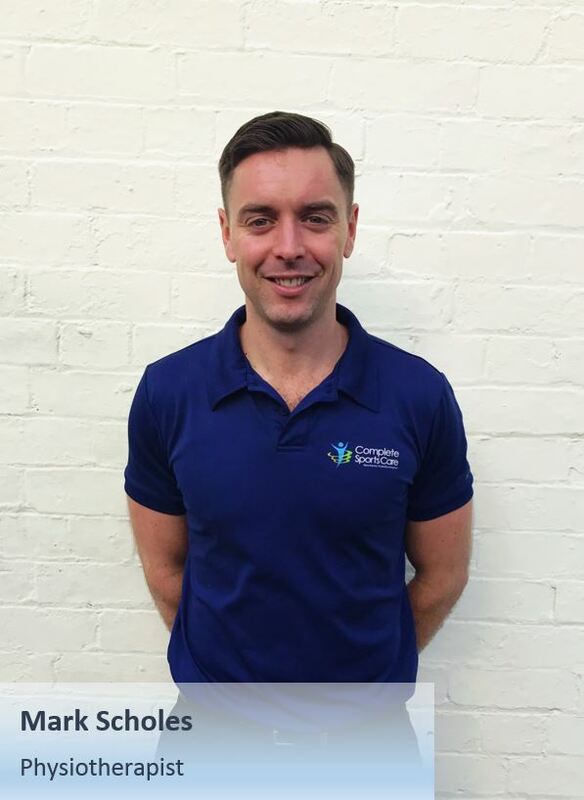 I have also previously worked with the Casey-South Melbourne district cricket team, where I honed my skills in the management of acute and chronic shoulder injuries – I still enjoy the challenge of helping treat difficult shoulder injuries and working with throwing athletes. I graduated from La Trobe University in 2007 and completed my Master of Sports Physiotherapy at La Trobe University in 2015, enabling me to be accredited as an Australian Physiotherapy Association Titled Sports Physiotherapist. Throughout my Master program I concentrated on the management of injuries sustained during AFL football, and spent time at both North Melbourne and Hawthorn football clubs. I am currently a PhD Candidate at La Trobe Sport and Exercise Medicine Research Centre, where my research is investigating running biomechanics in athletes with hip-related groin pain. Having dedicated myself to further study and understanding complex lower limb biomechanics, I pride myself on providing a thorough assessment of your injury and establishing the most effective rehabilitation program that is specific to you.